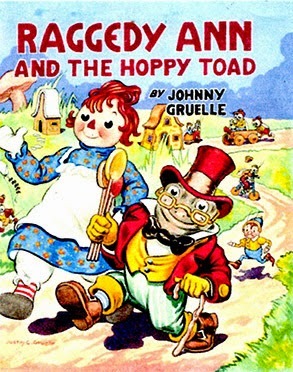 Johnny Gruelle (1880 – 1938) Justin’s older brother, creator of Raggedy Ann and Andy books and dolls. 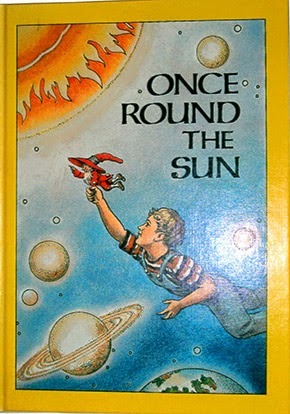 Justin added color to early drawings, painted doll faces, illustrated five books after Johnny’s death. Justin C. Gruelle (1889 – 1978) See “Justin C. Gruelle” blogsite, The Indiana, New York and Silvermine, Connecticut Years, Bill Smart’s outline for talk at New Canaan Historical Society, February 26, 2010. Tired of Connecticut snow-bound winters, Mabel and Justin Gruelle drove to Indianapolis to visit family and friends and on to Sedona, Arizona to visit grandchildren. They rented an apartment in Altadena, California near international headquarters, The Theosophical Society and Press, Pasadena. Gruelle had earlier been president of their Silvermine Connecticut lodge. 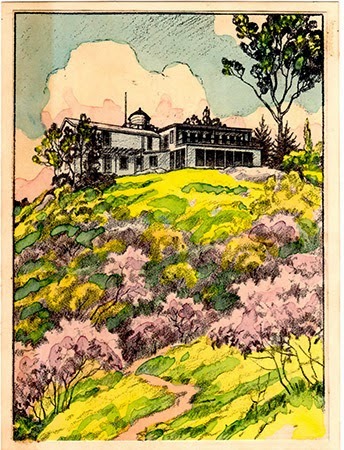 He created drawings in color, black and white for a children’s book, Once Round The Sun, painted a portrait of Theosophical Society Leader Colonel Arthur Conger, and printed a silk-screen image of their headquarters building. 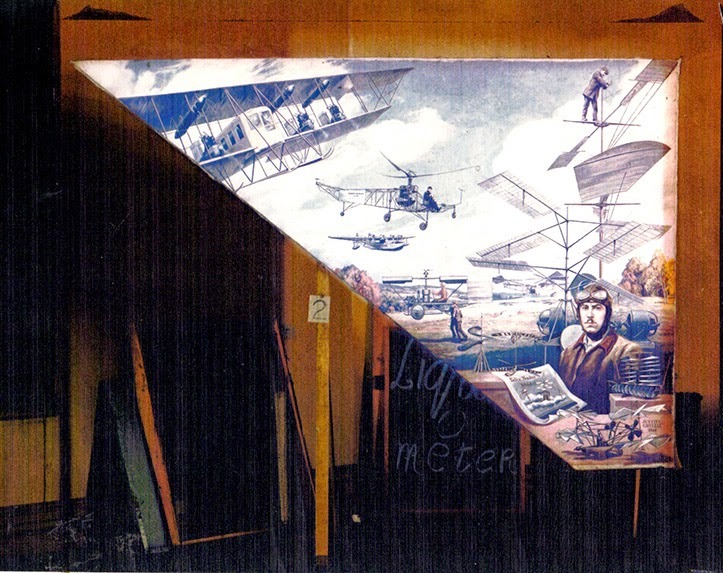 Gruelle’s history of early aviation mural, commissioned in 1940 by Clarence deGiers, for the lobby of Liquidometer Corporation, Long Island City, NY, was being presented to western headquarters, Institute of Aeronautical Sciences, Los Angeles. DeGiers asked Gruelle to paint an additional panel for the mural and supervise its installation. 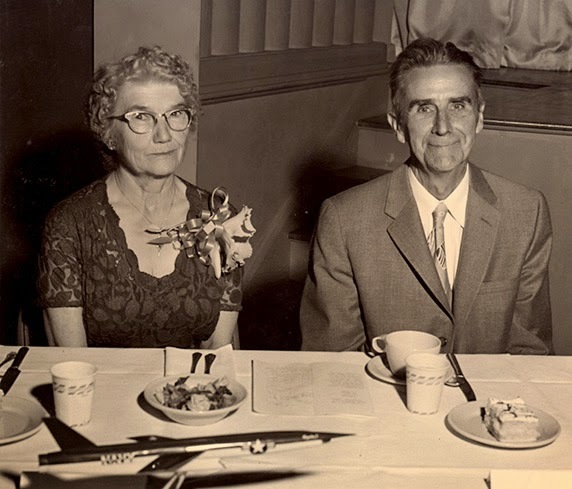 DeGiers and Gruelle had been friends since 1917 when they worked together in the advertising art department of Kelly-Springfield Tire Company, NY. Artist Justin Gruelle and wife Mabel were asked to extend their California visit for recognition at Fifth International Aeronautical Conference Banquet, Los Angeles. Executives of aviation-related companies praised his unique artistic and technical skills. “We went back to Connecticut and sold our Silvermine property.” Mabel's note card. At a farewell luncheon in New York Bill Smart encouraged his aunt and uncle to investigate Alpine where he had a memorable visit in 1946 after discharge from the U.S. Navy. “We returned to California to find a home. In less than a week we had decided on this place in Alpine which we love and were moving before the month was out”. This is the view from the north side of our place and the whole underside is Justin’s studio, workshop and dark room.“ Mabel Brown Gruelle, Christmas card, 1956. Building was later closed, murals moved to an unknown location, probably in California? 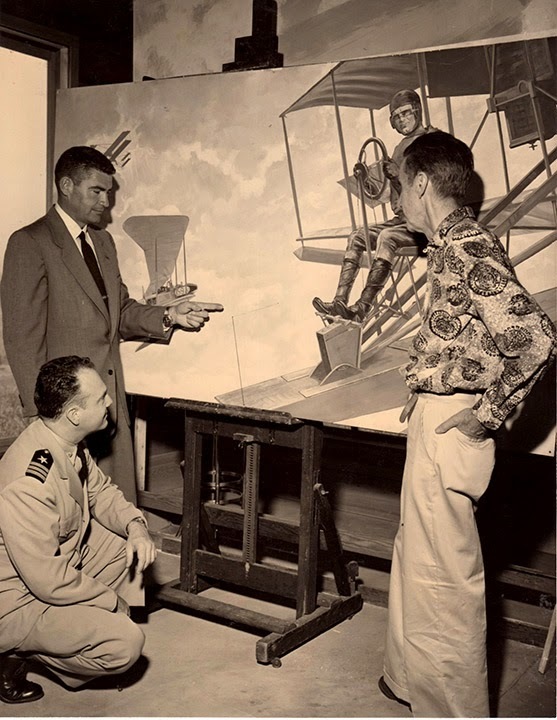 Executives of west coast aviation manufacturing companies were impressed with Gruelle’s technical and artistic skills in creating the Early Birds and History of Naval Aviation murals. They encouraged him to do research on the mythology and history of flight and create designs for decorative mural panels for a proposed National Air and Space Museum, for Washington, DC or on the West Coast. 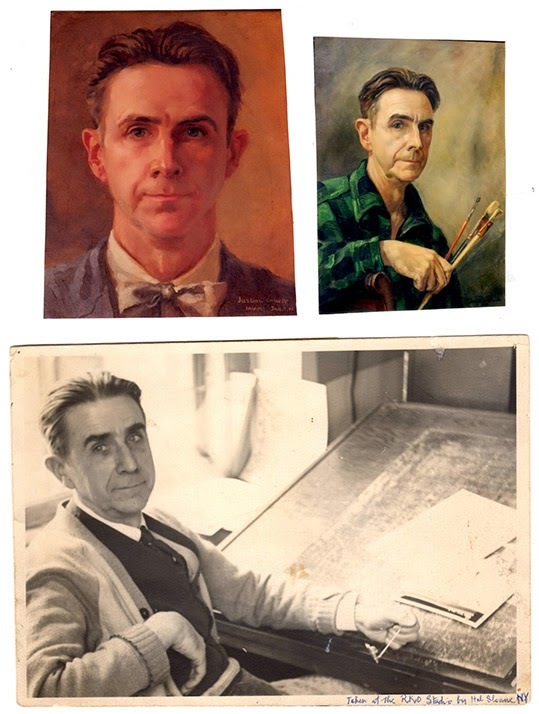 Gruelle did extensive historical research and created pencil and chalk sketches for five mural panels for the proposed museum. In May, 1918 Major Fleet was the first pilot to fly U.S. mail by air, from New York to Washington, DC. 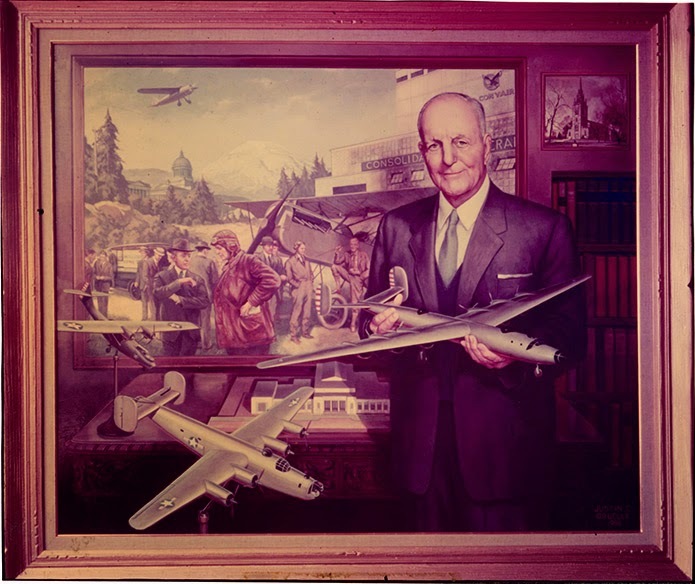 Gruelle’s portrait of Convair Corporation CEO was on view at Rueben H. Fleet Aeronautical Library, Institute of Aeronautical Sciences branch, North Harbor Drive, San Diego. 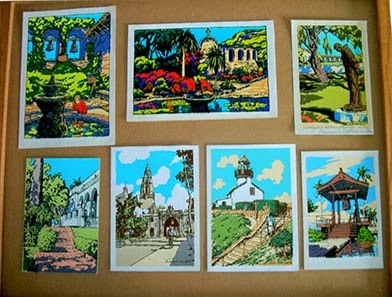 When the San Diego building was closed, the painting was moved to San Diego Air and Space Museum, Balboa Park. Justin Gruelle had strong religious and spiritual beliefs. Although not Roman Catholic, he and the local priest became good friends and had long discussions about how artists through the ages had interpreted Jesus Christ, his life, death and resurrection. 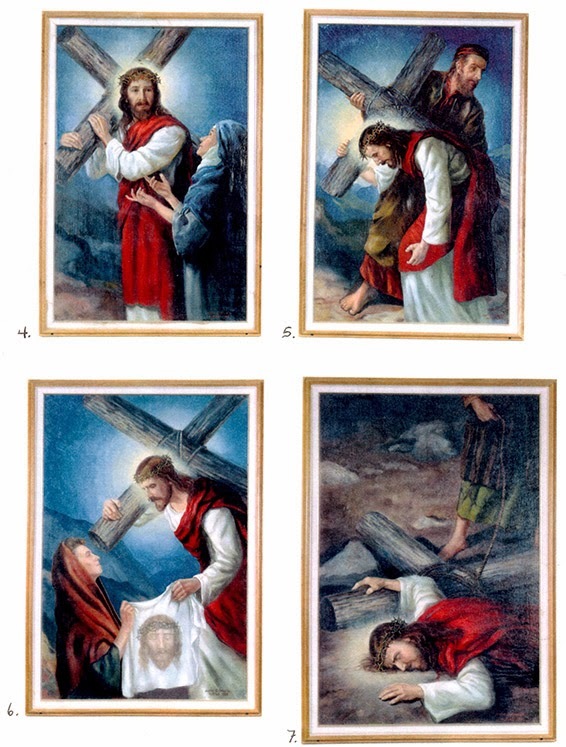 Gruelle painted near-life-size images of his version of the 14 stations of the cross as his contribution to the new community church. The priest contributed masonite panels and paint. Family members and locals served as models. 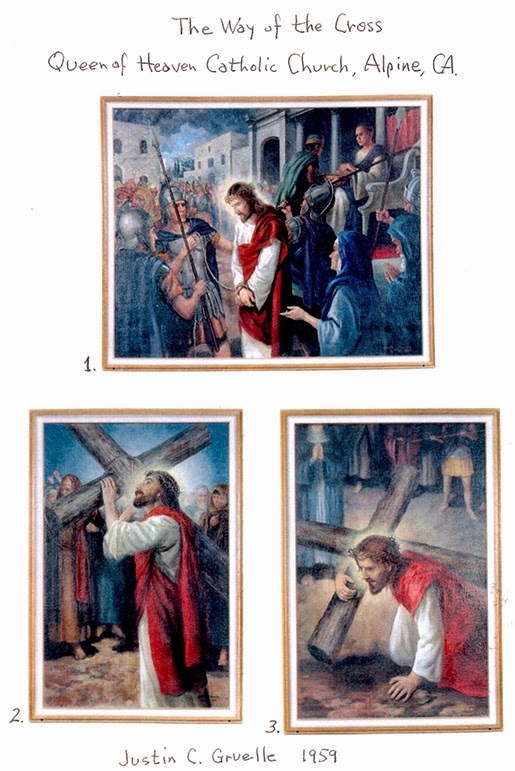 “These paintings picturing scenes in the life of Jesus have a depth of intensity and color not seen in the painter’s other work. They go from light to darkness and back again; they have no beginning and no end; they are limitless in time and space. This is beauty balanced with the quality of creation." 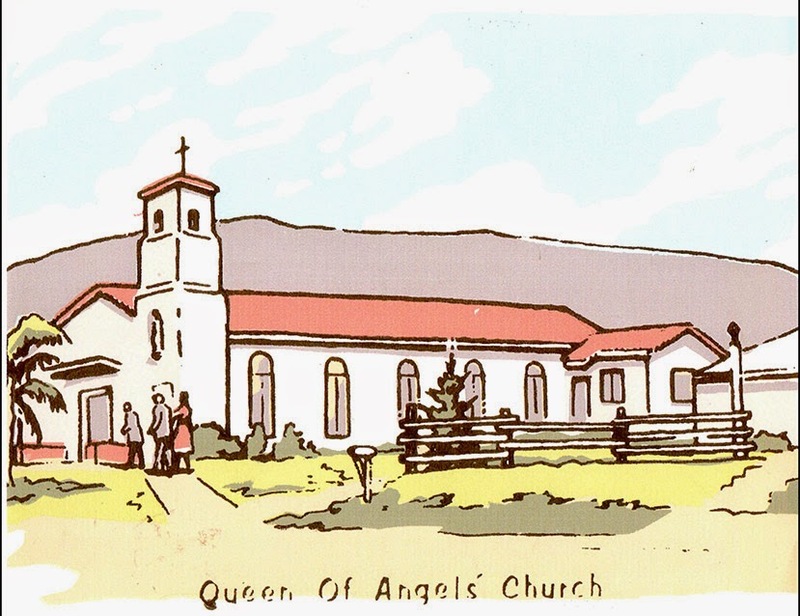 Greeting note cards with views of Alpine include 2 views of Catholic Church, 2 of Community Church, downtown Alpine, Women’s Club and Victoria Rock. San Diego views include Balboa Park, Father Junipero Serra Mission Museum and his statue. Justin Gruelle won first prize for a portrait painting. Gruelle’s original research and detailed pencil and chalk sketches were sent to the Smithsonian and their receipt was acknowledged. They were never used, never returned and there is no record that they existed. Photo copies and notes survived. May 12th, 1970, Gruelle's Early Birds mural added to collection of Smithsonian National Air and Space Museum, Washington DC. Rolled-up canvas shipped by Railway Express from California to DC. After its 1970 - 1971 exhibition at the Smithsonian National Air and Space Museum, the Early Birds mural was placed in storage awaiting Congressional appropriations to construct a new Air and Space Museum on the Mall. When it opened in 1975 the Early Birds mural was not on display. It had disappeared from sight and from their records. Repeated inquiries in person and in correspondence confirmed that there was no record of its existence in the current museum collection or archives and no record of what had happened to it. 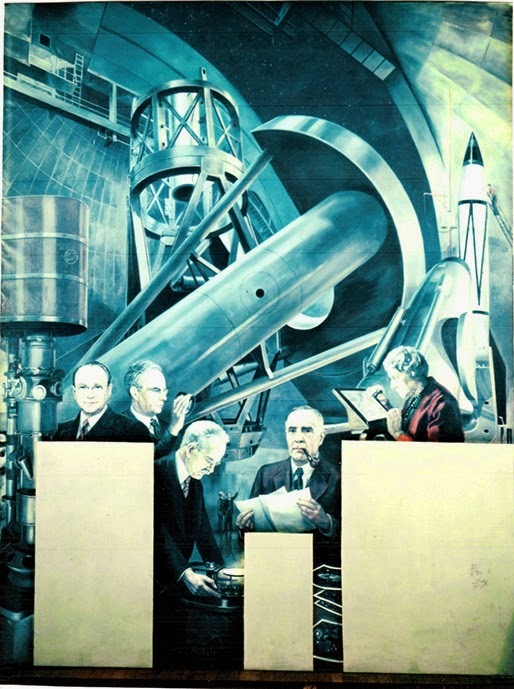 No information was available to Gruelle as to disposition of his three remaining 1940’s American Scientists and Inventors murals in the lobby of Liquidometer Corporation, Long Island City, New York. 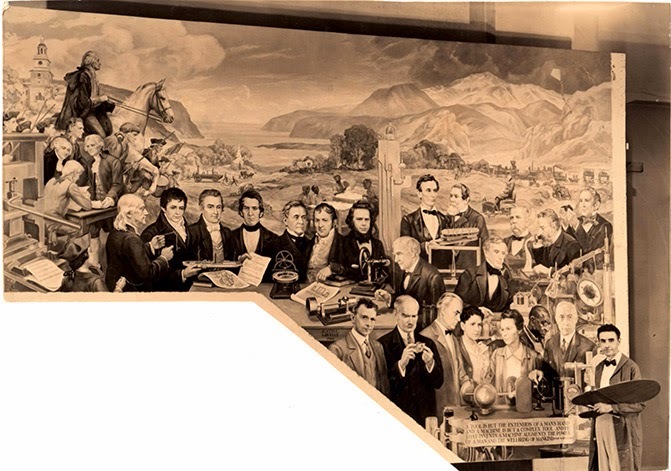 An 18’ x 7’ photo copy of the Early Birds panel had replaced the original canvas when removed in 1955. There was no information on the four 1950’s landscape murals in Liquidometer’s manufacturing facility in Bellows Falls, Vermont. Six Mark Twain murals, Aladdin and his lamp and Chinese Nightingale murals awaiting funds for conservation, restoration and relocation. 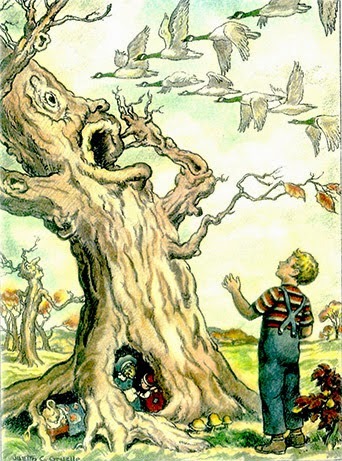 Future disposition of Gruelle’s five Aesop’s Fables 1936 WPA murals in question. Removed for possible restoration and placement in a new building addition. Commissioned in 1952 by Union Trust Bank, later First Union Bank, and then a restaurant. Plans announced to close the bank, to be occupied by a restaurant, with removal of mural with unknown future. 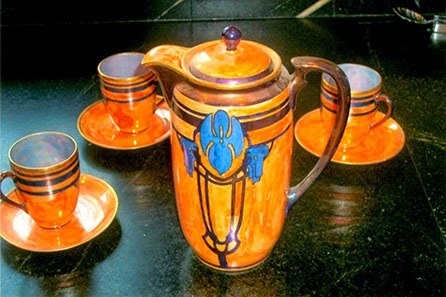 Her hand-painted china is on view in museums and private collections. Cremains interred in Gruelle Family plot, Crown Hill Cemetery, Indianapolis, Indiana, no marker. Smart had called from New York during the 1977 holidays to wish his uncle good health in the new year. Gruelle said that he would be reaching his 89h year in July, and added, “It will soon be time to pass-over.” Smart made an immediate air reservation to fly to California. 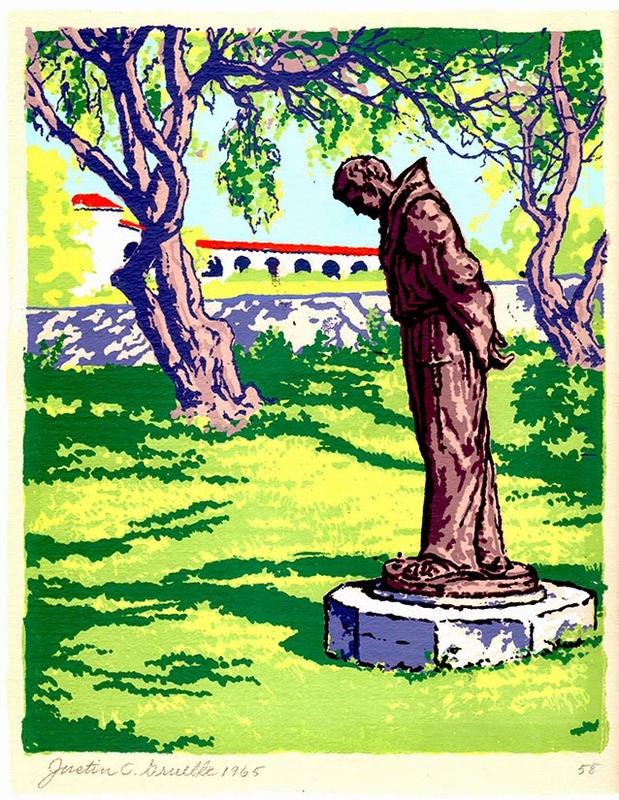 On January 2nd, 1978 they drove through Old Town to see the Mission and statue of Father Juniperro Sierra drawn on Gruelle’s silk-screen. Later he signed print 52 of the San Diego mission , “For Bill, With deep affection.”They visited San Diego Air and Space Museum in Balboa Park to view the Major Fleet portrait. They drove along the Pacific Ocean and watched the lingering afterglow of colors from a beautiful sunset as the sky changed to reveal a galaxy of stars in the universe beyond. Gruelle showed Smart his archival scrapbooks with photos, clippings and recollections of a lifetime of creative works. Gruelle was disappointed that so many of his murals and other works were “lost” or no longer on view. He emphasized his satisfaction that he had the vision and the pleasure of creating them. Smart promised his uncle that he would make every effort to continue to search for his favorite Early Birds mural and other “presumed lost” art works. 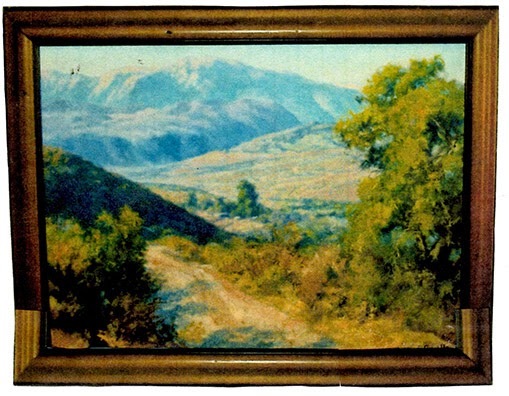 Before Smart left for NY Gruelle presented him with his last canvas, painted from his workshop / studio in Alpine, “Shadows in the Valley” with mountain views. Gruelle was saddened to learn that his prized portrait painting was “lost” in a devastating fire at San Diego Air and Space Museum in Balboa Park. April 20, 1978, Death of Justin C. Gruelle in San Diego. His cremains are interred with no marker at Crown Hill Cemetery, Indianapolis, Indiana in the Gruelle family plot next to his wife, Mabel and parents, Alice and Richard B. Gruelle. 1995, Early Birds mural, lost from view for 25 years, discovered at Dorchester County Museum, Cambridge, MD by nephew Bill Smart and wife Diane. It had been de-accessed from the National Air and Space Museum Collection and was located high on a wall of an old airplane hangar on the former Francis DuPont estate, now property of the University of Maryland. After several visits to photograph the mural President Dale Price and his Museum Board offered to give the mural to Smart in order to find an appropriate and more permanent home before the final closing of the museum. Smart contacted several museums. Indiana Historical Society, Bruce Johnson, VP, agreed to pay for removal and shipping to Indianapolis for December 2003 exhibit of The First 100 Years of Flight. 2003, exhibition at Indiana Historical Society, Indianapolis. Exhibited in lobby during 100th anniversary celebration of Wright Brothers’ first flight, (Wilbur had been born in Indiana). It then went back to storage awaiting results of a fund raising campaign. cover story, Traces magazine, Spring, 2003. Article had widespread distribution on internet. McGaw Foundation, Seattle. WA requested IHS to loan or sell mural for exhibition at Museum of Flight, Seattle. Smart agreed to transfer. 2006, extensive conservation and restoration at Indianapolis Museum, paid for by McGaw Foundation with shipment to Seattle. History of Aviation Gallery, Boeing Red Barn Wing. 2001, Eight Justin Gruelle W.P.A. murals. 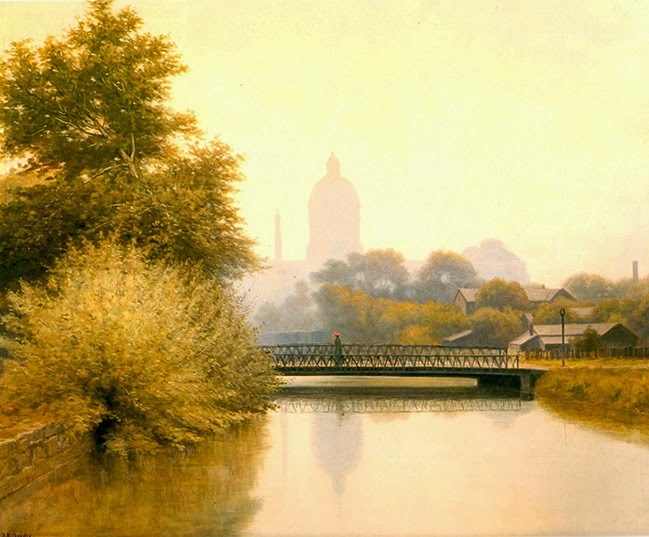 Restored and exhibited in Norwalk, CT City Hall Gallery and libraries. 2009, - 2010 New Canaan, Connecticut Historical Society Galleries. Exhibit of Justin C. Gruelle and family art . Bill Smart invited to speak about the Silvermine years of the family. See previous blog entry. 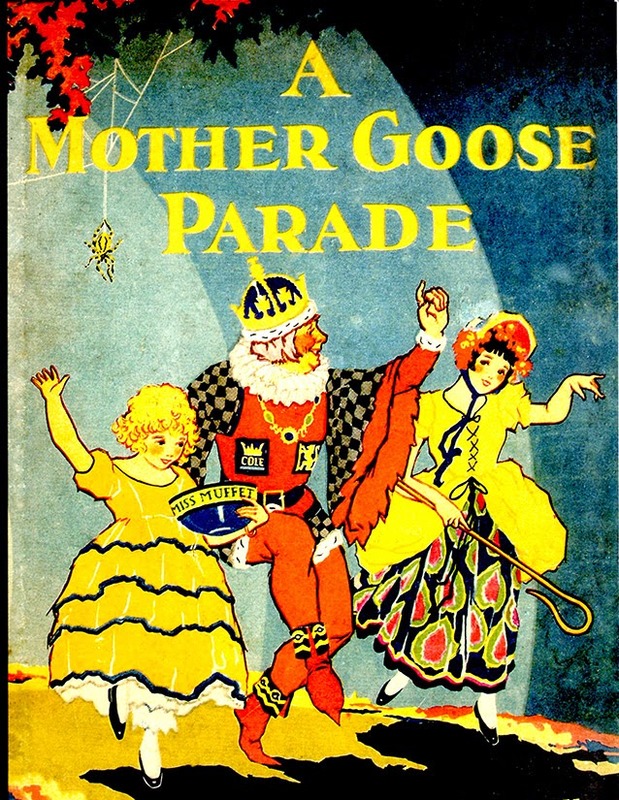 80th Anniversary edition, A Mother Goose Parade, written / illustrated by JCG. December, 2011, Donation of Diane and Bill Smart Collection of Justin Gruelle’s Connecticut paintings, illustrations and silk screen prints to City of Norwalk, Connecticut. Now on exhibit in City Hall Galleries alongside Gruelle’s W.P. A. murals. See “Norwalk Thanks Bill Smart” interview, December 17, 2011 Justin C. Gruelle blogsite. Painted in 1952 for a New Canaan bank. Had been removed when property sold and stored at New Canaan Historical Society. Now restored and permanently installed at New Canaan High School. August 5, 2013, Re-discovery of 3 of Gruelle’s Liquidometer 1940s “lost” murals in New York State by Bill Smart and daughter Anita. Igor Sikorsky and his invention of the Helicopter, Telescope on Palomar Mountain and Electron Microscope, and American Inventors and Scientists. Awaiting decision of current owners of building purchased from Liquidometer in 1971 as to their future. A new entrance lobby had been opened on an adjacent street. Original lobby stairwell with four large murals functions as an interior stairwell, poorly lighted, between 3 floors of the building. Still missing are four Liqidometer landscape murals originally installed in their manufacturing plant in Bellows Falls, Vermont, believed to have been given to employees when building was sold in 1971. Bill Smart was invited to talk, with power-point presentation, about later works of Justin and Mabel Gruelle during their California years, 1955 -1978. 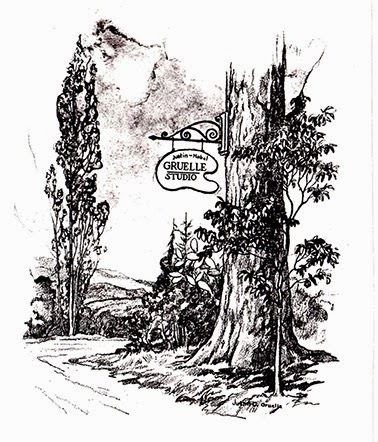 It was a follow-up to Smart’s February, 2010 talk to New Canaan Historical Society about Gruelle’s Silvermine Years that ended in 1955 with their move to California.